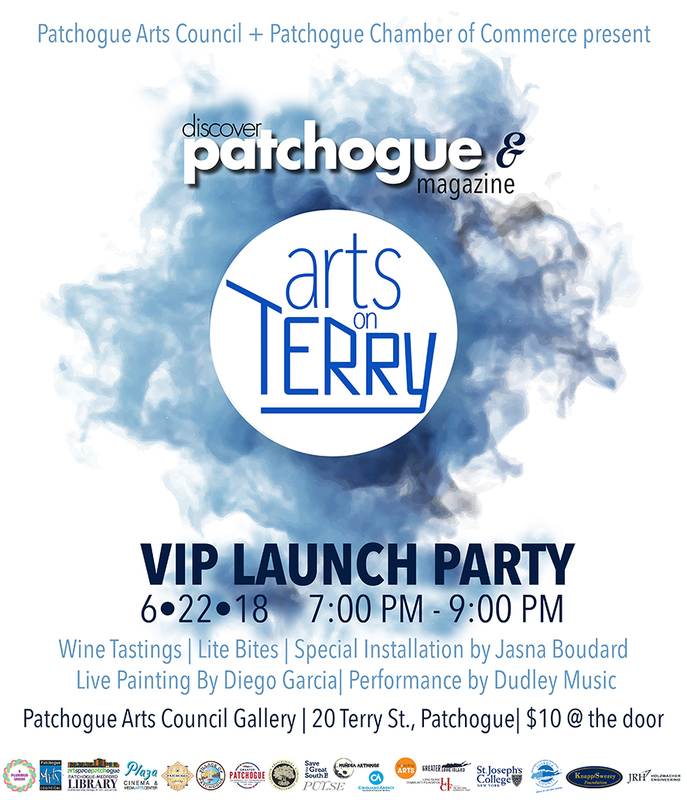 Arts on Terry & Discover Patchogue VIP Launch Party | Patchogue Arts Council, Inc.
invite you to join us for a special celebration to kick off PAC’s signature Festival Season event – Arts on Terry and the launch of the 2018 Discover Patchogue Magazine. Arts on Terry is a contemporary art fair for all ages highlighting 200+ artists from a variety of Long Island Arts organizations, each exhibiting a curated selection of works representing its respective community in 13 different pop up galleries. AOT will also include a full day of art exhibits, demonstrations, live painters, family friendly participatory activities, live music, poetry, and performances, all on Terry Street, Patchogue’s official arts district! The Greater Patchogue Chamber of Commerce is proud to be launching its third issue of the Discover Patchogue magazine and business directory. The magazine contains informative articles about local organizations, highlights the many community events that occur annually, and lists important contact information for local businesses and government entities. Join us on June 22 from 7:00 – 9:00 PM for live music by Dudly, live painting by Diego Garcia, special installation by Jasna Boudard, tasty bites with paired wines at the Patchogue Arts Gallery. The Patchogue Arts Council E Pluribus Unum Festival Season 2018 is supported with generous funding from the Suffolk County Office of Cultural Affairs, Knapp Swezey Foundation and the Long Island Community Foundation.